(Jan. 9, 2019) -- Whether you prefer to run or walk, get your best pair of sneakers and take part in the UTSA Alumni Association 35th annual Diploma Dash City Championship 5k on Feb. 23, 2019. The race is one of the first events that will officially commemorate UTSA’s 50th anniversary celebration. 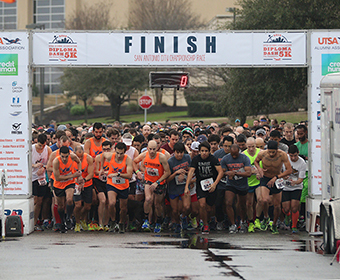 Sponsored by Credit Human, Diploma Dash brings UTSA students, alumni, community members and even some canine runners together to participate in a certified 5K race around Main Campus. The race and festival begin at the UTSA Convocation Center, and participants are invited to stick around for a post-race celebration, with sponsors offering food and drink. >> Register for the UTSA Diploma Dash. Diploma Dash began in 1985 and has grown into one of San Antonio’s largest chip-timed racing events. There are medal for top runners and awards for teams. It all benefits the worthy cause of helping UTSA students graduate. Thanks in part to the race, UTSA students like Juli-Ann Cordero and Ruben Mena have been able to cover their tuition costs and release some of the financial burden of pursuing their academic goals. Mena is a recipient of the Yvonne Katz Scholarship and is currently pursuing his master’s degree in educational leadership. Diploma Dash is open to all individuals, friends, families and teams with 14 age categories. Categories include Masters, Team Challenges, UTSA students, UTSA departments and ROTC students. Winners will receive medals with the UTSA 50th anniversary logo featured on the back. Participants can also register their dog for $10 the day of the race. “The more participants we have sign up, the more we can give back to our present and future Roadrunners.” Woodall said. Register for the UTSA Diploma Dash.